After watching the fireworks display at Robinson’s Mall, I heard from San Nicolenos that they are watching sarzuela at the cultural park. So I went there too and saw some friends and familiar faces. The Sarzuela Ilocana was entitled San Nicolas: Ili Nagtaudak. The 100 years evolution and development of the town was depicted in the story. From the colonization of the province by the Spaniards, its evangelization by having San Nicolas as their patron saint, coming of the Japanese forces then the Americans, to gaining independence in 1909 and living the rustic life by the people, engaging in occupations such as farming and pottery to the recruitment of sacadas to work in Hawaii and to the present situation of its people. The play has participated in by people from the different sectors of San Nicolas. There was drama, comedy, singing and dancing all rolled into one play. The theme song of the town was sung during the presentation. The town of Vintar has recently celebrated its 100th year. This was a former part of the town of Bacarra until it gained independence as a new town in the year 1909. This is a 1st class municipality of the province of Ilocos Norte. Its name was derived when an Augustinian missionary who was brought by Spanish commander Juan de Salcedo in the year 1574 to pioneer evangelization of Ylocos who visited this place. He wanted to meet the heads of the barangays and the guide let them form a line saying it in the vernacular “Ag-Intar kayo man basit,” which means “Please form a line.” Then a V shape was formed from the line. Out of these observations, the missionary then coined the name of the town. It was a coincidence that the shape of the V seemed to form the wings of a bird or an eagle. As I observed on my recent visit to Isic-isic, there were really a number of birds that hover around the mountains and rivers. We have seen canaoay which is commonly seen in the farm, eagle and the siwawer. This town is known for these birds. They have adopted the siwawer as the symbol of their municipality. As a tribute to this specie of bird, Siwawer Festival was conceptualized, prepared and held for the first time to coincide with their centennial celebration. I went early to the town and they had trade fair showcasing the produce of the different barangays. I even saw “baligot” a vegetable similar to the yam. The leaves and its bulb can be cooked into inabraw. Wood carvings of siwawer were on sale. The town is abundant with watermelon so I bought and ate the yellow watermelon. It was so sweet and refreshing. The dance parade was participated in by groups of young people dancing to the different local tunes. They were in ants’ costumes, painted their bodies of charcoal, with siwawer or bird feathers, and in fishermen and farmers’ costumes. Floats of balikbayans were also paraded around. This was followed by a dance showdown. 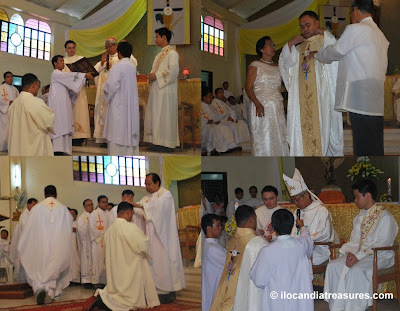 I remember that when I was a child, serving as altar boy, we attended a priest ordination in our community. The ceremony they held was no longer clear to me. This time when I heard that a deacon was soon to profess his faith, I went to Currimao church to catch a glimpse of that ceremony again. This was my second time to witness it. Fr. Lloyd was the candidate or ordinand. I already met him prior to his ordination. Ordination is a religious process by which individuals are consecrated to become clergy in order for them to perform various religious rites and ceremonies. The ceremony varies by religion and denomination. Ordination is a sacrament. It is likened to marriage of a couple. But for the priests they have to marry the Lord so they say. Once they become a priest, they will be forever priest. The affair was well attended by the members of the clergy, guests, relatives of the ordinand and other parishioners. Bishop Utleg celebrated the mass. Then the ordinand genuflected before the bishop. Later the candidate prostrates himself before the altar. He lied down in prone position. Prostration is a way to place the body in prone position. It is an act of submissiveness to God. The ordinand donned another set of vestments or liturgical garments assisted by his parents. The bishop imposed his hand on the head of the candidate followed by all the clergymen one by one. When the ceremony came to its end, all the members of the clergy embraced one by one the new priest to welcome him to the priesthood. When we attended the celebration of the Canonical Coronation of the La Virgen Milagrosa de Badoc, I can’t help but went around the church. The façade is equally stunning. So I took shot in front and at its gate. The historical significance of this church, aside from being the home of the miraculous Marian image which was washed ashore seven centuries ago to this place, this was also the church where the famous Filipino painter Juan Luna was baptized on October 27, 1857. His siblings were also baptized here. This was a place of worship for those victims in the uprising of Andres Malong in 1660-1661. I was surprised to know that this church was formerly called the Sinait Chapel in 1591. It became a parochial in 1714. This church is made of bricks and stones. It was buildt under the administration of Rev. P. Valentin Blovide. The patron saint of the town of Badoc is San Juan Bautista. The current parish priest is Rev. Fr. Calma. The town is about 35km or 22 miles south of Laoag. Annually, an Abel Iloco fashion show is being staged during the Christmas season in Ilocos. A fashion design competition is always a part of it. This is one way to promote the traditional craft. There were four local designers who competed with each other. One entry per designer was presented to the audience and to the board of judges. The board of judges was composed of Manila-based designers who had competed in international fashion design tilts. Abel is an indigenous product made in Ilocos. 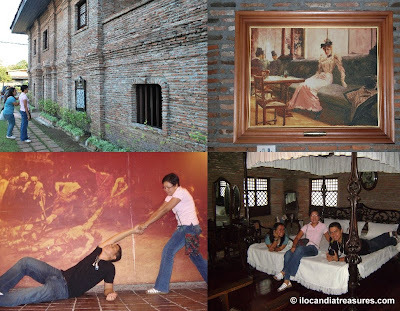 This textitle is manufactured in Paoay and Vigan as well. This is a product of painstaking hand weaving or weaving with the use of a handloom. The cotton yarn made from local cotton plants is the main material for this textile. The making of abel textile involves an intricate process. This is composed of preparing and dyeing the yarn, arranging different colors of yarn to produce the desired pattern, and manipulating the wooden handloom with synchronized movement of hands and feet. The usual Abel Iloco products that we know of include bed linens, blankets, bath towels, place mats, hand towels, table napkins and runners. But this time a fabric for fashionable and sassy clothing design especially by the winning design in photo by Amor Albano. This is truly a very versatile material that can be used anywhere and in any form and style. Its a world class.